There is a great restaurant near my office that I visit for dinner at least five days a week. The staff has become like family to me. When they're not so busy, the servers will stop to talk for a little while, which is always nice. One young server, Johnny, seems to have taken an interest in my work and often parks himself next to my stool at the grill. He's clean-cut, very well-mannered, and good at making conversation. He's truly a likeable guy. Recently, during a time when Johnny wasn't serving, I noticed there was a celebration going on in one of the back dining areas. Johnny soon came around the corner from that gathering to say he was enjoying himself with his family and a few friends in honor of his birthday. Johnny was now 21 years old. With rapturous joy, he hailed his rite of passage into adulthood by proudly holding up a six pack of brews he had been given as a present. Of course, I didn't say anything negative about the alcohol. I didn't want to spoil Johnny's moment. I wish he wouldn't drink. There certainly wouldn't be anything lost if he didn't. Still, there is one matter regarding Johnny's choice for booze that was comforting – he had to wait until he was 21 to legally drink it. Last Thursday (July 17th), marked the 30th anniversary of the National Minimum Drinking Age Act, signed by President Ronald Reagan in 1984. The law (MLDA – Minimal Legal Drinking Age), which requires an individual must be at least 21 years of age before purchasing and imbibing alcohol, unquestionably has saved tens of thousands of lives. After the repeal of prohibition, states were given the responsibility for determining the drinking age and most states established it at 21 years. Then came the Vietnam era, when the national voting age was dropped to 18 years, and consequentially the argument was erroneously made if someone was old enough to vote and go to war, they ought to also be old enough to drink. So 29 states dropped the MLDA to around 18 and the results were catastrophic. There were dramatic increases in alcohol-related traffic fatalities among youth from 18-20. These shocking statistics resulted in many states reversing course and putting the limit back up to 21. The value of such action, however, was diminished by the fact that many young people were going across state lines to drink where the limit was still lower. Thus, it was apparent that the nation needed a national minimum legal drinking age. Congress adopted one and then incentivized the states to adopt the same by threatening to take away some of their federal highway funds, if they didn't. By 1987 all 50 states had adopted the current MLDA of 21. The law has had its critics. "The Amethyst Initiative," in which a small number of college and university chancellors and presidents signed on to, argued the law drives drinking underground and therefore contributes to issues of binge drinking by youth. Institutions of higher learning should be allowed to teach students to drink responsibly, they contended. Unfortunately, the law's detractors get a lot of press. It's sensational journalism. But the jury is already in with 30 years of monitoring and research that clearly demonstrates the 21 MLDA is remarkably successful. Moreover, Time Magazine reported in 2008 that France is "grappling with wide-spread binge-drinking among its youth. Worse still, fully half of 17-year-olds reported having been drunk at least once during the previous month." So much for the argument that developing a so-called culture of responsibility towards alcohol will actually end the abuses of it by youth. In fact, prevalence rates for drunkenness among young people in the United States are less compared to those of European ages. What actually works is a form of prohibition. Don't misunderstand me; I'm not calling for a return to the kind of prohibition before 1933 in the United States. Nevertheless, it goes without saying that all forms of restrictive alcohol measures in state and federal law are an acknowledgement that alcohol is not an ordinary commodity. It poses a significant risk to the public's health and prohibitive determinations are necessary. This is especially true for those in their formative years. Naturally, the MLDA doesn't end all drinking by youth, no more than traffic laws end all speeding. The law is meant as a deterrent and never ends all law breaking. We still have serious problems with young people and alcohol. But alcohol policy like the MLDA does reduce the problems associated with alcohol and the nation's youth. And it does so because it makes alcohol less readily accessible – a principle that is fundamental to all effective alcohol policies that preserve and protect. Johnny may still choose to drink, but after 30 years of study it's clear, at least he's a little safer because he had to legally wait until he was 21. 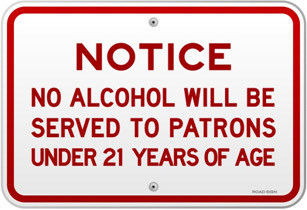 "On the Anniversary of the Drinking Age Act: Should the Drinking Age Be Lowered in the U.S.?" WFTS. N.p., n.d. Web. 18 July 2014. Time Magazine, July 17, 2008, Quoted in Brumbelow, David R. Ancient Wine and the Bible: The Case for Abstinence. Carrollton, GA: Free Church, 2011. Pg. 186. 108, and Journal Of Studies On Alcohol And Drugs / Supplement No. 17, 2014. Case Closed: Research Evidence on the Positive Public Health Impact of the Age 21 Minimum Legal Drinking Age in the United States (n.d.): n. pag. Web.